Hi, Welcome to my beginners guide to Twitter. But, what exactly is Twitter? Hi, Welcome to my beginners guide to Twitter. What is Twitter? Twitter is a social networking service that allows you to send and read text messages with 140 characters. In English that means that you can make a statement or sentence and put it out there to whoever is following you. This must be under 140 letters/characters. You need an email address. With your email address you sign up. The next page will ask you to select people to follow. 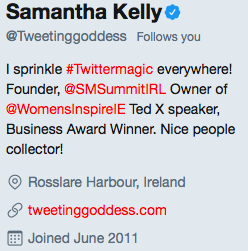 You can start by putting twitter names you might already know (Like me for example, @Tweetinggoddess into the search box). After you have followed your first five people they will ask you to follow more. But you can skip this step if you want to get cracking! You want to Make your profile look so interesting that people will want to click on you. You want followers as followers are your new friends! They are also your very own marketing team. They are the ones who will decide if you are interesting enough or if your content (what you say in your tweets) is good enough to Retweet to your followers. I recommend putting a picture of YOU -as it attracts people – people use twitter so makes you look more personable. If you are a small business owner, I recommend you put your picture up also. You can put your logo or icon on the background of your profile. If you are a company, then your logo is best. A hotel? A picture of the hotel etc. Your Bio: This should also be interesting, tell people who you are, what you do and your likes (e.g. hobbies etc) so you will attract like minded individuals. People buy from people so even if you are a company make it sound like you are approachable and that you are going to be tweeting interesting tweets. There is also a section to edit your profile so you put your website link into your bio so that when people look at your profile they can simply ‘click’ to go straight to your website! When on your profile page see ‘Edit Profile’ button on the left. Click on it! Next: Do your first tweet!! Start by saying something like…. ‘Hi Everyone, I am new to twitter! #Newbie’ – Keep it simple and be yourself. Then continue to search for people to follow. If you like gardening for example, search for any tweets that mention #gardening (Go to the search box) Twitter will also suggest others to follow on the left hand side of your account. You can refresh these suggestions if you want to search for more. Look at what the people you follow are saying….get involved and click ‘reply’ if you want to add to the conversation! Click ‘Retweet’ if you want to share their tweet with your own followers. To see who has mentioned you or interactions (for example who has followed you) Click on the Connect button. If you click on ‘Home’ this is your Twitter feed. These are the tweets of everyone you are following! If you want to tweet someone you follow Simply click on the tweet button (blue button top right) and put their Twitter name into the tweet. This is the ‘Compose’ tweet button. You can tweet away now. So off you go and start tweeting! Check out my top ten tips for using Twitter effectively also! More advanced tips and workshops also coming very soon!